The Rev. Fr. 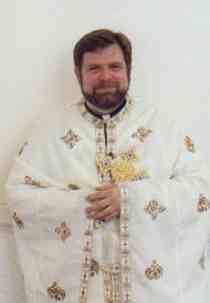 Steven Peter Tsichlis is a priest in the Metropolis of San Francisco in the Greek Orthodox Archdiocese of America. Father Steve was born in St. Louis, MO, on January 11, 1953, and is the son of the late George and Thelma Tsichlis. Raised in St. Louis at the St. Nicholas parish, Fr. Steve graduated from the University of Missouri in 1974 with a B.A. in history and philosophy; received a certificate of studies from the University of Thessaloniki in Greek and Byzantine History in 1977; graduated from the Holy Cross Greek Orthodox School of Theology in Brookline, MA, with a Masters of Divinity in 1978; graduated from Yale Divinity School with an S.T.M. in 1981; and pursued a doctorate in patristics with the late Fr. John Meyendorff at Fordham University in New York. Fr. Steve met his wife, Kathleen, in Boston while both were in graduate school. They were married on July 1, 1979, at St. Luke's Church in East Longmeadow, MA. They have four children. Fr. Steve was ordained to the diaconate in 1980 by the late Bishop Gerasimos of Abydos at the St. Nicholas Church in St. Louis and served for several years as the deacon to the late Metropolitan Silas of New Jersey. In 1983, Fr. Steve was ordained to the priesthood by Metropolitan Silas at the Holy Trinity Church in Waterbury, CT, and was assigned by then Archbishop Iakovos to pastor the Assumption Church in Seattle, WA. In 1997, Metropolitan Anthony of the Diocese of San Francisco assigned him as pastor of the Church of St. Paul in Irvine, CA. In addition to his pastoral duties in Seattle, Fr. Steve served as the vicar of Metropolitan Anthony of San Francisco for the Northwest region of the diocese; president of the Diocese of San Francisco Clergy Syndesmos; a member of the Archdiocesan Presbyters Council; president of the pan-Orthodox clergy council of the State of Washington; Orthodox ecumenical representative to the Church Council of Greater Seattle; a member of the Seattle/St. Petersburg (Russia) sister churches program; and was instrumental in founding the St. John the Almsgiver Ministry, a pan-Orthodox program to feed the homeless in Seattle. Since arriving in southern California, Fr. Steve has been the vicar of Metropolitan Anthony for the southern California region of the diocese. Currently, he serves on the advisory board of the Orthodox Peace Fellowship; is president of the Archdiocesan Presbyters Council and edits their newsletter, The Presbyter; and is a member of the board of directors for Project Mexico and St. Innocent's Orphanage near Tijuana, Mexico. This page was last edited on February 16, 2018, at 14:28.